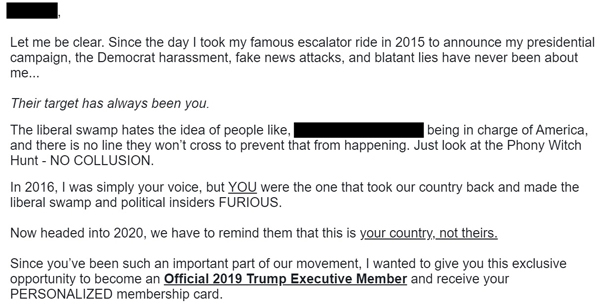 Shakesville: Trump Tells Supporters: "This Is Your Country, Not Theirs"
Trump Tells Supporters: "This Is Your Country, Not Theirs"
A friend of mine has signed up for Donald Trump's email list using her dog's name so that she can keep tabs on what he's communicating to supporters, and occasionally she forwards a particularly egregious missive to me. The liberal swamp hates the idea of people like, [Redacted Name and Location] being in charge of America, and there is no line they won't cross to prevent that from happening. Just look at the Phony Witch Hunt - NO COLLUSION. Since you've been such an important part of our movement, I wanted to give you this exclusive opportunity to become an Official 2019 Trump Executive Member and receive your PERSONALIZED membership card. That was followed by a fundraising pitch. The sitting President of the United States is fundraising off of saying that anyone who doesn't support him doesn't have a stake in this country. He is demonizing us as enemies of the state by suggesting that we don't belong here and will do anything to stop a "real American" from leading the nation. This is part of Trump's escalating war on dissidents, and it is stochastic terrorism.